Itʼs another beautiful winter here in Calgary and the time has come to think about building an outdoor skating rink for you and the kids to enjoy. If you want a functional thing of beauty that can be enjoyed all season, and not a big embarrassing mess in the back yard, here is some helpful advice to follow. People often think that the best way to make a skating rink is to follow the old fashioned method and simply dig a hole in the snow, pack it down and fill it with water from the garden hose. It sounds great in theory, but the reality of this scenario is two days of standing outside in the cold, with a hose out the kitchen window, a huge utility bill for the water and sewage, and an unusable mess in the back yard. First of all, here in Calgary, we rarely get enough good wet snow to be able to pack it into a form for the sides of the rink. Itʼs just too dry. With an average 1/2” garden hose, it would take you over two days of continuous hosing to fill the rink, and to avoid a big frozen mess, youʼd need to use the kitchen sink instead of the outside tap, which means your kitchen window would open the whole time. The best tried and true Calgarian method of skating rink building is to call for some help from a qualified water delivery service such as Big Rock Water Hauling that can pour as much water in 15 minutes as your garden hose can provide in two days and you wonʼt have to heat the whole neighbourhood doing it. After you book your water delivery and confirm that there is adequate access, start the prep work. * If the ground is too frozen for the rebar, try using cement blocks or 6 x 6 lumber that will still be able to take the weight of the water. Next, you will want to line the bottom of your rink with a waterproof lining. A large tarp works great for this, just make sure the tarp is completely waterproof and that no water can get underneath. If this happens, the tarp will lift and freeze in the middle of your ice, or worse, poke through the top of the ice and catch the skates of unsuspecting skaters. Make sure that your liner/tarp wraps over the boards and is held down in such a way as to prevent it from slipping into your rink. Staple it to the outside of the board or use leftover rebar as a weight. You can also use your extra rebar or other non-buoyant materials to weigh down the middle of the trap to prevent it from lifting and causing bubbles. * Do NOT use excess sticks or lumber as they will FLOAT and get frozen into the ice surface. Make sure that your rink is level. The water will self level to provide a smooth surface, but if the difference from one side to the other is too great, you may end up with six inches of ice on one side, and one on the other, or worse yet, too much weight on one end could cause a blowout. Once you have prepared your surface, call BIG ROCK WATER HAULING and book your delivery. It is best to book 24- 48 hrs in advance to check the weather report for a snow free day, or find a way to cover your rink from fresh falling snow during the freezing process. 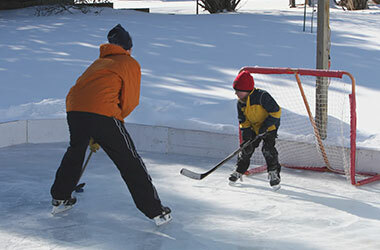 When the truck arrives, be sure to have the rink free from debris and fresh snow and wear rubber boots in case something goes wrong and you need to get into the water to fix it.For larger rinks, you may want to fill the rink in multiple layers. The first layer will create a smooth level subsurface and top layer, a perfect skating surface. After the ice has frozen completely, it may require some fine tuning with a shovel and scraper to remove any bumps that may have formed during the freezing process and a bit of careful flooding with warm water to provide that final professional finish. Once you start using the rink, itʼs a simple question of maintenance to keep it going. Shovel it with a heavy steel scraper after skating and when it snows. A light layer of snow can actually be helpful, keeping the ice nice and cold. Wet, heavy snow will soon stick to the ice and make it bumpy. Get rid of it as soon as possible. Give your rink a light flooding after every three or four times you skate on it, and make sure it is as free of snow as possible when you do. The truly obsessed will sweep the ice after shoveling it. Every once in a while, run a little warm water through the hose. It will melt the chopped up top layer and make it nice and smooth.